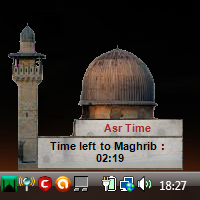 Prayer Times on your desktop. 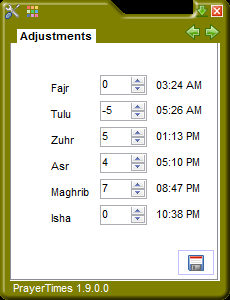 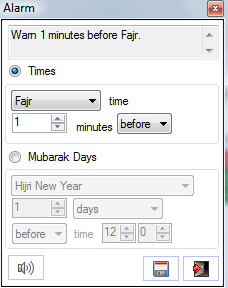 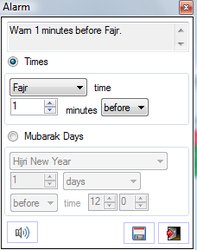 Know the prayer times, hijri date and Qibla direction. 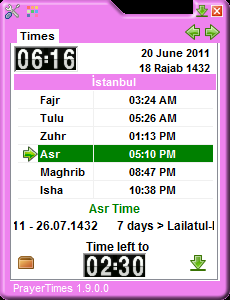 Listen the Azan-ı Serif on your selected prayer times. Calculates prayer times for WorldWide. 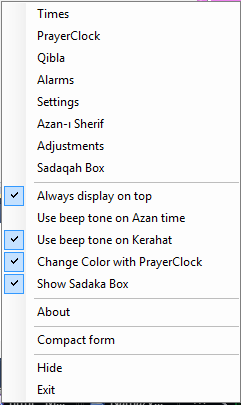 You can change transparency setting. 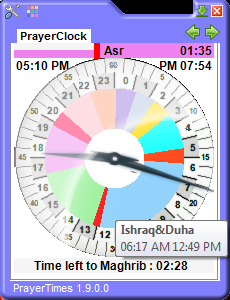 Prayer Clock Colors of prayer on 24 hours based analog clock. By the grace of Allah عزوجل as a result of the joint efforts made by the I.T Majlis and Tauqeet Majlis of Dawat-e-Islami, a global non-political movement for the preaching of Quran and Sunnah,an excellent Software namely Timings of Salah’ has been designed on the basis of the research of Ala Hazrat Maulana Shah Imam Ahmed Raza Khan. 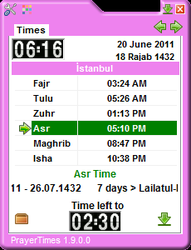 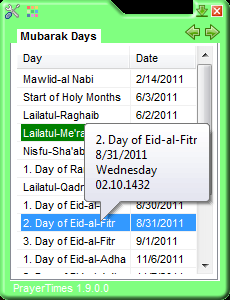 Apart from the timing of Salah of more or less twenty Seven hundred thousand places of the world,the direction of Qiblah can also be ascertained by virtue of this software.Moreover,the timing of Salah of any place of the world can be ascertained with the help of certain options.By virtue of the software’s particular options,the details of twelve month’s timings of Salah,Qaza Salah,direction of Qiblah,Sehar, Iftar and sacred days may also be ascertained.